Documenting top high school prospects, 2016 Leaf Metal Perfect Game All-American Classic Baseball debuts as its own product, joining the line of Metal Baseball sets. Previous PG All-American cards were only issued as inserts in the manufacturer's other releases. Every box offers eight autographs. Each year, top high school baseball players representing the East and West Coast gather to showcase their skills in front of friends, family, fans, and, of course, scouts. This is where many of these athletes become top draft picks. Because of this, 2016 Leaf Metal Perfect Game All-American Classic Baseball highlights some of the most anticipated MLB draftees. A key attribute for collectors, all autographed cards are hard-signed, including the base Metal Autographs. Various parallels are also available for the main autograph set, including Colored Etch Star and Super Prismatic, which is numbered one-of-one. Collectors can expect nearly all of the Metal Autograph parallels to be limited to 50 copies or less. 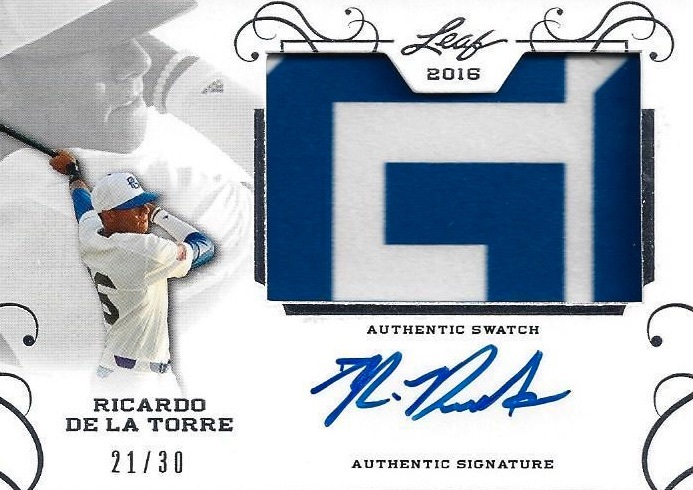 2016 Leaf Metal Perfect Game All-American Classic Baseball memorabilia cards also offer on-card signatures, with every relic card numbered to 30 or less. Patch Autographs showcase player-worn jerseys, hats, or pants, although it should be noted the items are not game-worn and are event-worn items from the PG All-American Classic photoshoot. Some of the harder-to-find patches include Nike logos, buttons, flag patches, and hat logos. Each box contains at least one signed relic card. A limited release, only 125 cases of 2016 Leaf Metal Perfect Game All-American Classic were produced. PARALLEL CARDS: Blue Prismatic #/50 or #/25, Purple Prismatic #/25 or #/20, Pink Prismatic #/20 or #/15, Black Prismatic #/15 or #/10, Green Prismatic #/10 or #/7, Red Prismatic #/5, Gold Prismatic 1/1, Gold Super Prismatic 1/1, Printing Plates*. 52 cards. MSP = Mega Short Prints. PARALLEL CARDS: Blue Etched Wave Foil #/12, Purple Etched Wave Foil #/10, Pink Etched Wave Foil #/7, Black Etched Wave Foil #/5, Green Etched Wave Foil #/3, Red Etched Wave Foil #/2, Gold Wave Foil 1/1, Gold Super Prismatic w/Black Etched Foil 1/1, Printing Plates*. 52 cards. Silver numbered #/30. PARALLEL CARDS: Gold Foil #/15, Red Foil #/10, Blue Rainbow #/5, Silver Rainbow #/3, Gold Rainbow 1/1, Gold Rainbow (Game-Used Relic) #/2, Printing Plates*. Shop for 2016 Leaf Metal Perfect Game All-American Classic Baseball boxes on eBay. Lisa grew up in Arlington, Texas where she regularly attended Rangers games and fell in love with baseball. She began collecting her favorite players' cards when every pack came with a stick of gum. With almost every baseball release, Lisa continues to grow her collection. She is also an avid fan of WWE, MMA, comics and every genre of music. Lisa is a former member of The Cardboard Connection Writing Staff. 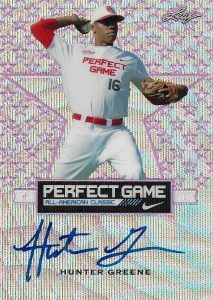 2016 Leaf Metal All-American Perfect Game Classic Baseball Sealed Box 8 Auto's!